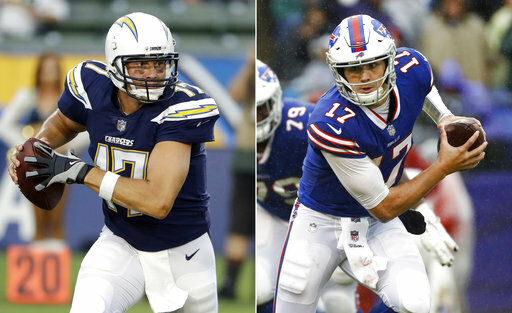 The 0 – 1 Los Angeles Chargers come to town Sunday to face the 0 -1 Buffalo Bills to open the home portion of the Bills 2018 NFL schedule. The Chargers may have lost to Kansas City last week but they still have a lot going for them. A look at their roster. Phillip Rivers is arguabley one of the five best quarterbacks in the entire National Football League. He may be 36 years old, but he still can move around very well and sling it. Last week at home versus Kansas City he threw for 424 yards and a 66.7% completion rate. Trust me, he’s dangerous. The Chargers have a strong complement of receivers on their roster led by Keenan Allen. Allen isn’t a speedster but he is a great route runner who can get open short and deep. The other wideout is 2017 first round pick Mike Williams, who has both size and speed and is just beginning to come into his own. The Chargers play a lot of three wide out formations and when they are in that offense, Travis Benjamin is the third guy. The tight end is ageless Antonio Gates, who splits time with Virgil Green. Both are excellent receivers. The Chargers will use two running backs with Melvin Gordon being the lead guy. Gordon has great speed and is beginning to become an excellent receiver as well as a top runner. Second year pro Austin Eckler complements Gordon very well and is also reliable as a runner and a receiver. The Chargers will be without right tackle Joe Barksdale this week. He is injured. He will most likely be replaced by Sam Tevi. Forrest Lamp, who was a high pick a year ago and missed the season with an ACL, will see action at guard though he may not start. While the Chargers don’t have a lot of big names on the O-Line, they perform very well as a unit. Last week they gave up only one sack in over 50 passing attempts. All Pro Joey Bosa won’t play, but the Chargers still have a feared pass rusher in Melvin Ingram. Inside Darius Philon and Brendon Mebane do an excellent job stopping the run and applying pressure in the pass game. Chargers Head Coach Mike Lynn says that rookie Justin Jones will get a lot of play time. Jones missed much of the preseason with an injury. Except for Kyle Emanuel, the Chargers don’t have a lot of size at the linebacker position but they can all run. Mike ‘backer Denzel Perryman has great instincts and range. This is a tough group to go against as they can play the run and drop into coverage equally well. If there is a weakness in the San Diego defense its with the secondary as they lost corner Jason Verrett for the season. Casey Hayward Jr. is very capable and so the guy the Bills need to attack is Trevor Williams. First round pick Derwin James leads the safeties and many feel he will become a similar type player as the late Sean Taylor. James has excellent size and speed and can play man coverage like a corner. The other safety is Jahleel Addae who is undersized for a safety at 5’10 – 195 but he’s tough. He had five tackles last week in the loss to Kansas City. With their performance last week in the 47-3 loss to the Ravens, many in the national media have the Bills rated as the worst team in the NFL. I strongly believe that while the Bills have a lot of weaknesses on their roster, they are far from the worst team. I look for the Bills to bounce back from last week’s game. With first round quarterback Josh Allen getting the start, the Bills will have a conservative game plan. If they want to win, they have to run the ball and control the clock. That means the defense has to play like they did a year ago and create turnovers. On offense, both Allen and the offense in general has to be mistake free. This game is winnable, but the Bills need to play the perfect game.